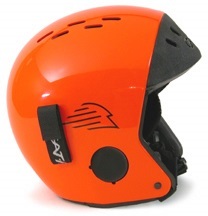 Specially suited for water ski racers, this high-visibility International Orange Gath helmet has sealed audio vents designed to prevent water pressure entry and to block wind and noise. A strap retainer in the rear (not on side as shown) helps keep goggles in place. Correct fit is critical. The helmet needs to fit snugly around the head and ears, tight enough not to move around, yet still be comfortable. Have someone else measure around your head at forehead level using a cloth tape measure; a metal tape measure will not give an accurate measurement. In general, front-to-rear stability is more important than side-to-side. The comfort strip fitting system is very versatile. Be creative with different padding combinations and configurations to customize the fit to your head shape. Some customers even lift the internal liner flaps and put segments of comfort strips underneath, using the self-adhesive back to stick them to the shell. Choose from a selection of high-quality painted colors or a black “rubber” coating finish.